I seem to be doing a lot of posts about the Moon lately, and I do try to present a varied mix of topics. But when I received the above photo from Raul Espinoza, a member of our astronomy club, I just had to use it. It’s a beautiful example of the interplay of light and clouds. There’s a lot of physics happening here. Truth be told, this image might be rotated from its correct up/down orientation. It’s hard to tell sometimes with sky photos. But it looks fine like this, and still demonstrates several optical phenomena worth talking about. As I’ve said many times, Sky Lights isn’t just about pretty photos (even though we’ve got a lot of those). There’s always something we can learn by careful examination of any natural phenomenon. 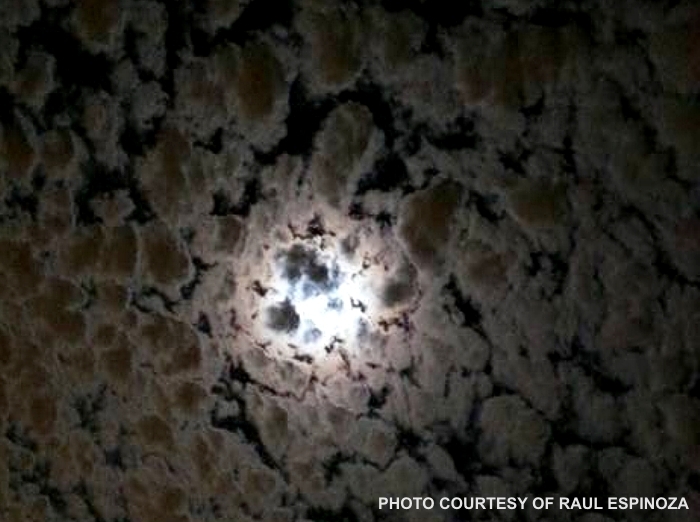 Raul’s photo was taken a day before the Full Moon of September 29th, so the Moon was essentially “full.” The numerous small clouds are typical of the Southwest monsoon season, which is just now ending. You can’t really see the Moon directly, but its light is creating some interesting effects. First, note how the clouds in front of the Moon are silhouetted against its bright disk. Those clouds appear bluish in color for the same reason the sky is blue. Clouds farther from the Moon appear more “neutral” in color, but show just a hint of red-orange. To my eyes, there’s also a little bit of green in the mix. Those colors are caused by diffraction and interference of moonlight around small water droplets or ice crystals in the air. The color you see depends strongly on the size of those droplets or crystals. Even in a clear sky, this effect can create what is called a corona. Coronae (plural of corona) are normally formed as circular rings, and can also be seen around the Sun when conditions are just right. Usually the Sun’s brightness overwhelms them. Not so with the Moon. In this case, there’s just too many clouds in the way to see the circular corona clearly. It’s superimposed against those luminous clouds. Diffracted red-orange and green light nevertheless imparts color to the surroundings. Finally, note how the clouds seem to have silver linings. That’s because they’re being lit from above. The cloud’s edges let through more light than the thicker central part. Sometimes clouds get in the way of doing my primary hobby, astronomy. But when they do, I can almost always enjoy other spectacular displays on Nature’s celestial canvas. Next Next post: Sky Lights #200!